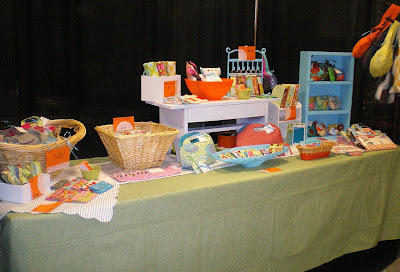 I officially have a craft show under my belt! It was definitely an interesting experience. Nerve wracking, stress inducing, pimple producing. . . yet fun and kind of addicting once I got settled into my booth. I got some great advice from fellow vendors and got a feel for how these shows work. If you had asked me the night before the show if I would do another, I'd have replied with a resounding "Heck, no." Now, I'm thinking if the right show came along at the right time and price, I would jump at the chance to do another. I'm thinking I did fairly well for my first time out. Although the show was very well organized and advertised, it never got super busy. It was Spring Break here and I think that may have been an issue. Also, the majority of the vendors were not handmade. I was definitely in the minority which I think both helped and hindered my sales, if that makes sense. The shoppers of this show for the most part were not my target audience. However, since I am really limited as to how far I can travel to do a show, this show was pretty much the only option. I do feel like I got some great advertising out of it which is always a plus! Since this was most likely going to be the only show I do this year, I didn't want to spend a ton on my display. I also have major lack of storage in my home so that was another issue to keep in mind. I made use of stuff I already had at home (baskets, hat tree), scoured local thrift stores for props for my table, and used a bunch of spray paint to tie everything together. I used a gift card to buy a table cloth and all in all, spent about $40-50 on my display. The little bookcase ($5) is now in my sewing room and the table ($9) is on my porch so I'll definitely get my money's worth. 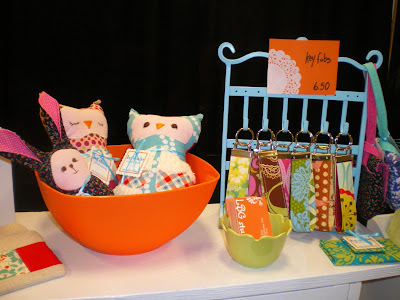 By saving money on my display I was able to get cute price tags and post cards with my shop info printed on them. The night before the show I did a mock set up in my bedroom. I used masking tape to mark off a section of carpet that matched the dimensions of my table. I set everything up and took photos. The next day, when I went to set up my booth, I used the photos as a guide to speed things along. I changed a few things around when I saw where the traffic would be coming from. 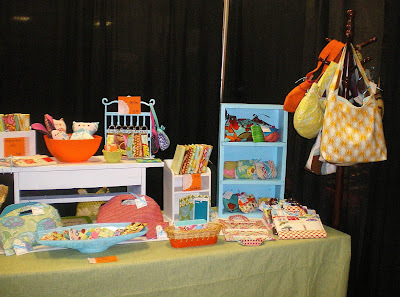 I began with my table set back in my booth and eventually moved it to the very front of the booth (advice from a fellow vendor). It made a big difference! I also learned to get all painting done at least 2 weeks before the show. We had yucky, rainy weather the whole week before the show and some things didn't get painted! Also, I didn't get to the price signs until the absolute last minute and didn't get to do them as planned (digitally). My only option ended up being to do it by hand. Luckily I had some scrapbook paper, glue, doilies, and a sharpie so it wasn't a total fail. 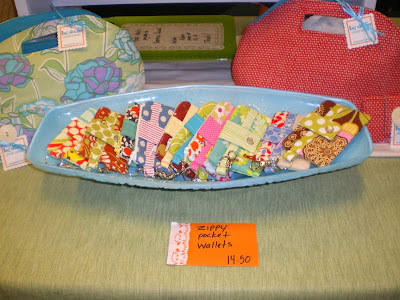 My most popular item was the Crafty Kids Art Tote. I sold out! If I do another show, I plan to bring a ton of those. 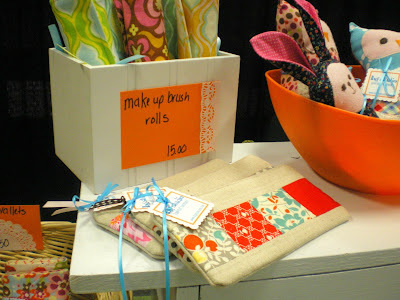 My crayon wallets were popular as well. I also sold quite a few key fobs. It was my most inexpensive item. 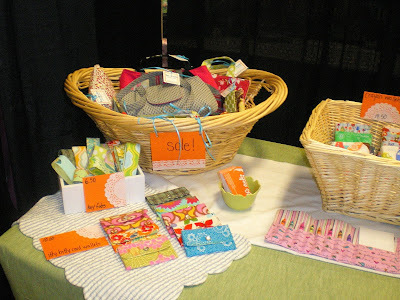 I also had a sales bin with irregular/sample items and I sold a lot out of it. It was really hard to know in advance what would sell well but I think that in the future, any kid stuff will do well. People tend to spend more on their kids than they do on themselves. I opted against getting set up to accept credit cards for this show. I think in general it is a great idea and will probably increase sales. I was lucky in that everyone was able to pay by cash or check. If anyone is interested, I did find a great deal through Propay. If I had more shows lined up I would have definitely gone that route. Craft show aftermath. . . my house was a disaster zone, my kid quit taking her naps (though I finally got her to take one today. finally. thank goodness), and I have yet to get my Etsy shop back up and running. I've got to go through and delete everything that I sold and photograph and list stuff that didn't. I've also got a handful of custom orders to get cracking on. . . never a dull moment! I hope to get a tutorial up soon and maybe do a little giveaway. Fingers crossed. . . This was an indoor show and the booths came with the black panels/drapes and a black tablecloth. They also provided a small sign which was hung at the very top of the booth so it got cropped out of the photos. I think if there is a next time I will spring for a cute sign to hang on front of my table. I knew going in that there wasn't going to be much handmade. Figured I'd try my luck. I would be upset as well if I had signed up for a show advertised as handmade only and it wasn't-that's shady. Sorry that happened to you! If you can find a show that's a good fit for you I say try again. Good luck! Congrats on getting through your first show . . . I know you've been working on this for a long time! I love your display. 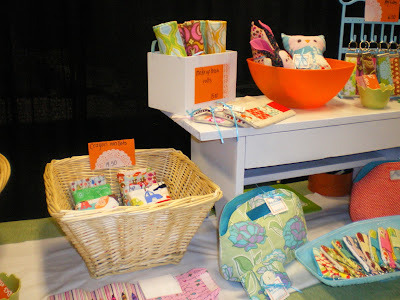 It must have been really satisfying to see all your hard work laid out and looking pretty together :-) Those crafty kids art totes are REALLY cute! About the display. . .it had to grow on me. When I first pulled up to the venue and saw huge trucks, I got nervous. When I walked in, I almost left! There were some seriously elaborate set ups in there. But, after getting lots of positive feedback and realizing that everyone has to start somewhere, I got over the nervousness and just had fun with it! I was thinking about how your craft show went! Your set up looks great! And your goods look beautiful! Sorry you didn't have enough of the right kind of buyers. 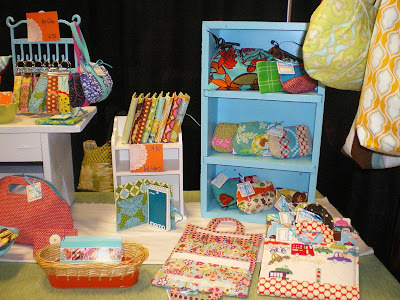 I dont' like the craft shows that are really just a bunch of made in china crap. What a joke, how can they advertise it as a craft show. Anyway, I'm glad you'd do it again. congratulations on your first craft show ... now you can breath • it must be really nerve wracking • i even get anxious setting up a garage sale • i always say that it is a learning experience • thank you for sharing your experience • i will definitely keep these in mind • btw, your display looked very attractive, the colors and the layering of the items • they made me get motivated to do one soon.